A selection of badge designs are available. You can use these as a basis and then just let us know how you would like to modify either the design, the layout, or the wording. There is no charge per word but remember that the badge is only 57mm in diameter. So there is a balance between the amount of text and the size that at which it can be read and printed. Some of our designs contain basic designs and some have the option to upload a photograph of your loved one. These are only suggestions, so if you have an idea that includes a combination of designs , then just contact us. 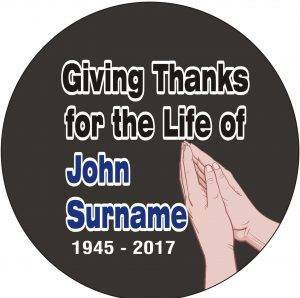 Just let us know the design you like and we can incorporate them into a personalised funeral badge for you. Once we have all the information from then we are normally able to despatch all orders within 24 hours.